Elke T. was abandoned at the Lancaster Shelter, and Karen Barnes went there to evaluate her for the Thulani Program. Karen found a happy, lively, affectionate little dog about 12 years old that had a mammary tumor the size of a small football. Because the Thulani Program has had a lot of success removing such tumors and giving the dogs as much as a year or more of quality life, we took Elke into the program. Sadly, in this case we were just too late. Elke spent a few happy days with us, but then her tumor burst and she descended into a deep physical depression. She stopped eating and did not want to get up. 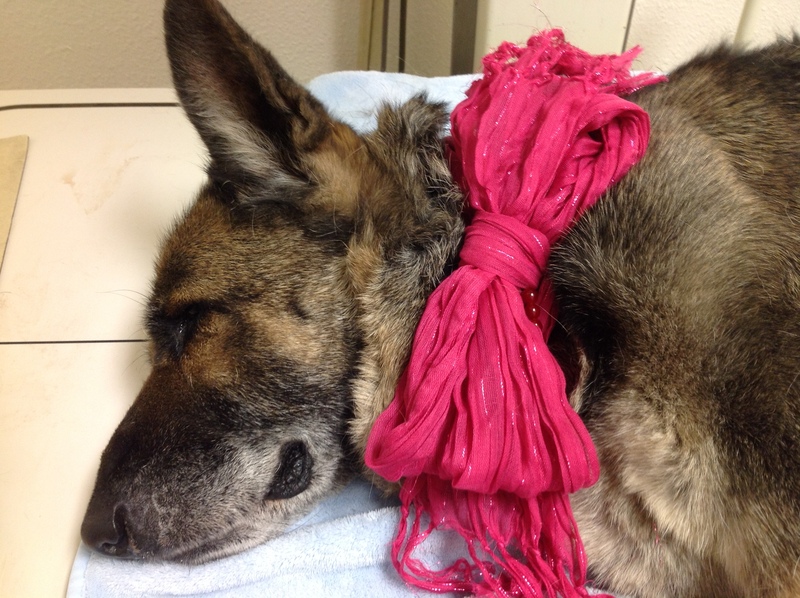 A Veterinary examination originally intended to prepare her for removal of the tumor, revealed that the tumor area was severely infected, that she had pneumonia, and that the cancer had spread to her lungs in a very serious way. We made the decision to euthanize Elke to keep her from suffering. We strongly feel that if her former owners had just abandoned her a few months earlier, we could have had a chance to give her a quality final chapter. But it was not to be. Karen stayed with her while she crossed over to the Rainbow Bridge. Rest in Peace, Elke, our thoughts are with you. Fly free sweet Elke. So glad you had some good lovin’ in your final days…….